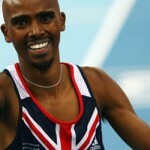 Double European champion Mo Farah (coach: Alberto Salazar) delivered the performance of the day when he smashed the European and British 5000m indoor record at the Aviva Grand Prix in Birmingham. 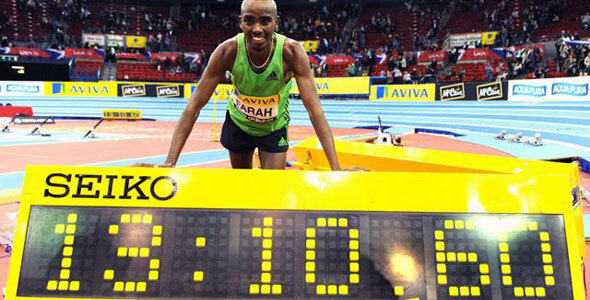 In a fitting conclusion to this season’s Aviva Series, Farah – who had shared the lead in the latter stages of the race with his new training partner Galen Rupp – set the NIA alight as he kicked on the back straight to race home in 13:10.60 and obliterate the 29-year-old UK best recorded by Nick Rose in 1982. 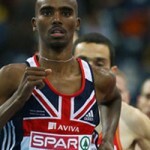 Farah had started off conservatively and initially was as far back as 20m off the leaders, but as pacemaker Scott Overall stepped off the track with 15 laps to go, Farah, who took home a bonus of $5000 for his UK best time in addition to winner’s prize money, moved up into third and was already well inside record breaking pace when he moved to the front. “I’m really happy, it felt good,” he said. “The crowd made a big difference and it was a nice race for me with Galen [Rupp] my new training partner so I’m look forward to the next few months. Rupp finished second in 13:11.44, a US national record, and in a sub-plot which added even more to the excitement in the early stages of the race, three British athletes were targeting European Indoor Championships qualifying performances for Paris next month over 3000m, provided they could go on to finish the 5000m race. Unfortunately it wasn’t to be however, and Ryan McLeod (coach: John Nuttall), Ross Murray (coach: Craig Winrow) and Johnny Mellor (coach: David Evans), who had fought hard for the 7:54.00 time, finished just outside the mark with McLeod getting closest with a 3000m split of 7:54.15. There were five British winners in total over the course of the afternoon and eight world leading performances in yet another high class Aviva Grand Prix. World Indoor silver medallist Jenny Meadows (coach: Trevor Painter), 12 months on from her British Record at the same venue, once again raced to victory, clocking a season’s best time of 1:59.22. Paced in the early stages by Vicky Griffiths, Meadows kicked for home with 250m to go and went through the bell in 1:28.44. Both events had been preceded by an exceptional women’s 3000m in which Sentayehu Ejigu (Ethiopia), the 2010 World Indoor bronze medallist, raced to victory in perhaps the most impressive world leading performance of the day (8:30.26). While it was a world class demonstration of endurance running from the 25-year-old, Britain’s Helen Clitheroe (coach: John Nuttall) destroyed her lifetime best in a brilliant European leading performance to go sub-8:50 for the first time ever with a mark of 8:39.81 when finishing fourth; a time which placed her to eighth on the overall UK All-Time list. And in stark contrast to last weekend’s Aviva Indoor UK Trials and Championships, the 1500m events both delivered in outstanding fashion on this occasion. In the men’s race Kenya’s Augustine Choge – who defeated defending Aviva Grand Prix champion Deresse Mekonnen (Ethiopia), twice World Indoor Champion, into second (3:33.97) – kicked at the bell and raced to a world leading time and lifetime best performance of 3:33.23 to take victory, and in doing so pulled all four British athletes to PBs, with three significantly inside the qualifying standard for Paris. Colin McCourt (coach: Craig Winrow) clocked a brilliant 3:38.71 to lead the quartet and race to the fourth fastest time in Europe this year, while Andy Baddeley (coach: Andy Hobdell), the UK 3000m champion, was hot on his heels with a new best mark of 3:39.16 in preparation for the longer distance event in the European Championships. Nick McCormick (coach: Lindsay Dunn), the UK 1500m champion, who had already reduced his lifetime best in 2011 when securing the national title in Sheffield last weekend, smashed that mark by five seconds when clocking 3:40.69 – also inside the Paris target time – for ninth, with Lewis Moses (coach: John Nuttall) also reducing his PB when finishing 10th in 3:43.56. Abeba Aregawi (Ethiopia) demolished the field to take victory in the women’s 1500m with victory in 4:03.28, also a world leading time, but it was a race of individual highlights as Kenya’s Irene Jelagat clocked a new National indoor record (4:06.90) in second. For British duo Hannah England (coach: Bud Baldaro) and Stacey Smith (coach: Mick Woods), who finished third (4:07.24) and fourth (4:07.42) respectively, the personal rewards were even greater as both athletes achieved the European Indoor Championships qualifying standard and smashed their indoor PBs, Smith in fact reducing her overall lifetime best by over two seconds. Nigel Levine (coach: Simon Duberley) further reduced his 400m indoor lifetime best with a brilliant European leading time of 46.17 to secure victory and at last secure the qualifying standard for the European Indoor Championships in Paris. The Aviva UK Indoor 400m champion, who had earlier watched an almost unbelievable men’s National 400m with Richard Strachan (coach: Linford Christie) and Nick Leavey (coach: Simon Duberley) clocking the second and third fastest times in Europe this year with marks of 46.35 and 46.49 respectively – also European Indoor Championships qualifying standards – will now be targeting a European Indoor medal to add to his World Indoor Championships 4 x 400m bronze 12 months ago. Aviva UK 400m champion Kelly Sotherton (coach: Aston Moore) admitted she was “gutted” to finish outside the European Indoor Championships qualifying standard of 53.00 when finishing sixth (53.70) in the women’s 400m. Kelly Massey (coach: Stephen Ball), the leading British athlete in the race, finished fourth in a season’s best of 53.54 with Jamaica’s Novlene Williams Mills winning in 51.87, the fourth quickest time in the world this year. In a summary of the remaining results of the day, local favourite Phillips Idowu (coach: Aston Moore), the World and European champion, took victory in the men’s triple jump in his competitive debut for the year with a mark of 17.57m ahead of Sweden’s Christian Olsson (17.20). In the pole vault, Luke Cutts (coach: Trevor Fox) finished runner-up on countback with a season’s best height of 5.60m behind Mark Hollis of the United States with 5.60m, but it was sad news for Steve Lewis (coach: Dan Pfaff) who was taken to hospital with a suspected fractured thumb in the pole vault. The bad news continued in the men’s 60m as Mark Lewis-Francis (coach: Linford Christie) pulled up towards the end of the men’s 60m heats with an apparent groin injury, at this stage not confirmed as a strain or a tear, and was taken for a full assessment by the UKA medical team. It didn’t end there however, because following the final, Harry Aikines-Aryeetey (coach: Michael Khmel), already with the European Indoor qualifying standard, had to be assessed by the UK medics following a potential hamstring problem which occurred two-thirds into the race. “I felt something…it just didn’t feel right,” he admitted. The race was won by Michael Rodgers (USA) in a lifetime best mark of 6.50, equalling the fastest time in the world in 2011 to date, while Bernice Wilson (coach: George Skafidas) continued her consistent run of form when finishing second in the women’s 60m in 7.26 behind Gloria Asumnu (USA) in 7.25. Lawrence Clarke (coach: Malcolm Arnold) clocked two PBs in one afternoon as he first recorded 7.70 in the 60mH heats before reducing that by a further one-hundredth of a second in the final when finishing eighth (7.69), but it was Aries Merritt of the USA who took the victory in 7.49 with Britain’s Andy Turner (coach: Lloyd Cowan) – who won’t compete in next month’s European Indoor Championships – in third (7.61). Gemma Bennett (coach: Lloyd Cowan), in a race was won by the USA’s world leading athlete Kellie Wells in 7.87, was the first British athlete home in the women’s 60mH in fifth (8.15), while in the women’s 200m Bianca Knight (USA) clocked an impressive world leading mark of 22.89 to take victory. Joice Maduaka (coach: Loren Seagrave), crowned UK Indoor champion for the ninth time when taking victory in Sheffield last weekend, finished third in a season’s best time of 23.59. Germany’s Sebastian Ernst won the men’s 200m in a PB of 20.58 with Britain’s Danny Talbot (coach: Daniel Cossins), building on his victory in last weekend’s Aviva UK Championships, finishing second in his international Grand Prix debut with 20.94. Michel Torneus (Sweden) won the men’s long jump with a distance of 7.97m while last weekend’s brilliant Aviva UK champion Tom Parsons (coach: Fuzz Ahmed) won the men’s high jump with 2.21m on countback and Abubaker Kaki (Sudan) took victory in the men’s 1000m (2:17.75). In the men’s 400mH demonstration event, former World and Olympic 400m hurdles champion Felix Sanchez took victory in 49.76 with Britain’s Rick Yates (coach: Stephen Ball) finished third in 50.21.